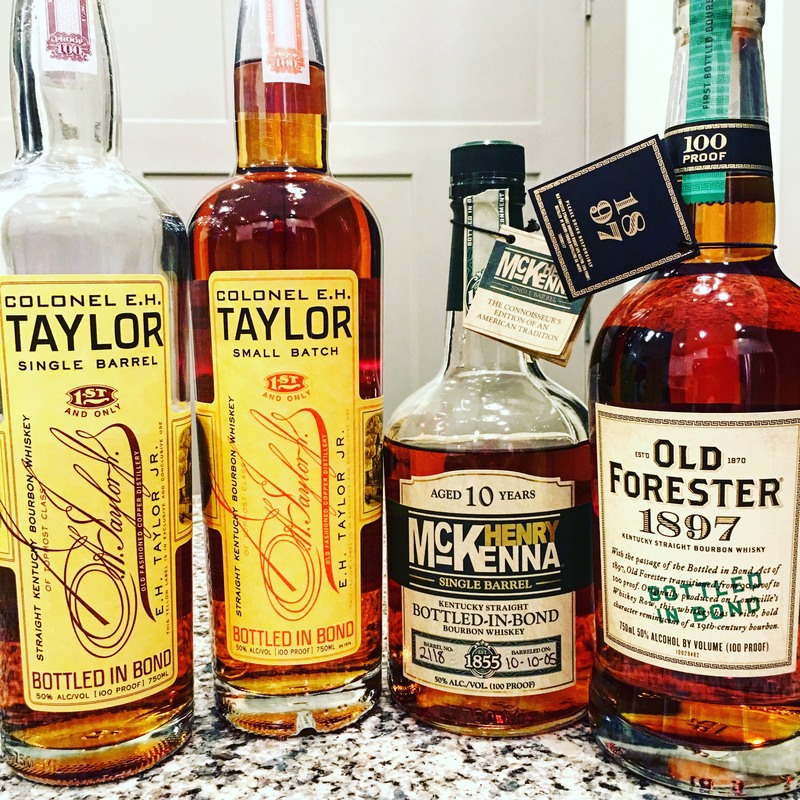 If you haven’t been following our bottled-in-bond challenge, you’ve been missing out. Make sure to check out Chapter 1 and Chapter 2 if you haven’t already. With most of our challenges, it’s important to note that these bourbons were both bought and drank by us. Although we would have been happy to get some samples direct from the distillery, we got these on our own and as always our views regardless are honest and our true opinion and we hope we help! If you all joined our Instagram Live, we thank you, but we cut this one short to make sure we headed over to @timmergund‘s page to see what cocktail he was making for all of us tonight (spoiler alert: It was an upscale Long Island Iced Tea and if you didn’t see it you should watch his YouTube video). All of these bourbons come in at 100 proof and 50% ABV, so the biggest distinguishing factors will be price and taste. The first one we went with was Henry McKenna. You can pick this one up for under $30. Zeke’s Take: For a 10 year this one didn’t have a lot of refinement to it. There was corn on the palate and a slight singe on the initial taste and throughout, and light anise on the back. This one was okay, but probably a good mixer. John’s Take: There was a burn on the front of my mouth, but a distinct oak and char on the back end and throughout the finish. There was light corn and this one got sweeter as you opened it up and let it out of the bottle. Next, we went with EHT Single Barrel. Depending on where you live, and how cool the stores are, this one is anywhere from $50-$80. Zeke’s Take: A lot of alcohol on the nose with some sweetness to the palate. This one honestly didn’t taste too astringent. For 100 proof, it breathes heavier than the proof. For the age and proof, I’m not sure why this one takes so long to get there. John’s Take: The burn on this one hits me mid-mouth and I am getting a very dark taste with this one. Lots of oak, tobacco, and a hint of caramel. It’s enjoyable to me but I have a sneaking suspicion I am going to like the Small Batch more. At this point we put the the McKenna up against the EHT Single Barrel. Although both of these are great, we had to say goodbye to Henry McKenna and his bottled-in-bond bourbon. Next up was Old Forester Bottled-in-Bond. You can pick this one up pretty much everywhere for around $50. Zeke’s Take: Very sweet nose. Not like corn sweet but caramel and toffee. It was kind of like a brittle. Palate matches the nose and it’s got a very appealing profile, especially if you’re serving up to someone new drinking bourbon or serving neat. John’s Take: This had the sweetest nose of all the ones we’ve tried. I got a burn in the back of my mouth, but it didn’t travel down to give me the Kentucky Hug I thought I would get from this. The finish was not as strong as I would have expected, as this one left me just like it came. It was enjoyable but not memorable. Finally, we put up EHT Small Batch. This one, if you’re lucky, you can find somewhere in the $30-$40 range but it sometimes falls in the $50 dollar range depending on where you’re at. Zeke’s Take: This is very similar to the Single Barrel to me. A lot of alcohol astringent comes off the nose and this masked whatever taste this has and I don’t understand it for the 100 proof. I was expecting more. John’s Take: Wow, I couldn’t have experienced a different reaction. This one was by far the smoothest of the 4 we tasted tonight and probably the most enjoyable experience for me. This one actually gave me hints of vanilla, toffee, and caramel, that I found were overpowered by the oak in the other 3. Definitely an enjoyable pour neat. So who won the night? For the first time in this challenge, Zeke and I are torn and need your help. You can join in on our Twitter poll to help. Zeke is a big fan of the Old Forester for all the reasons he had already mentioned. I am a big fan of the EHT Small Batch. I think the Small Batch is the best taste for the price and I enjoy the smoothness that makes this one a comfortable go-to. For that reason, we are at a crossroads and will be taking both of these along to the final with us. Something we were trying not to do, but unfortunately are going to have to do in this case. What’s your favorite? Let us know! We’ll be taking this Sunday off for Memorial Day, but hope to catch up and bring you the finals soon. Cheers!